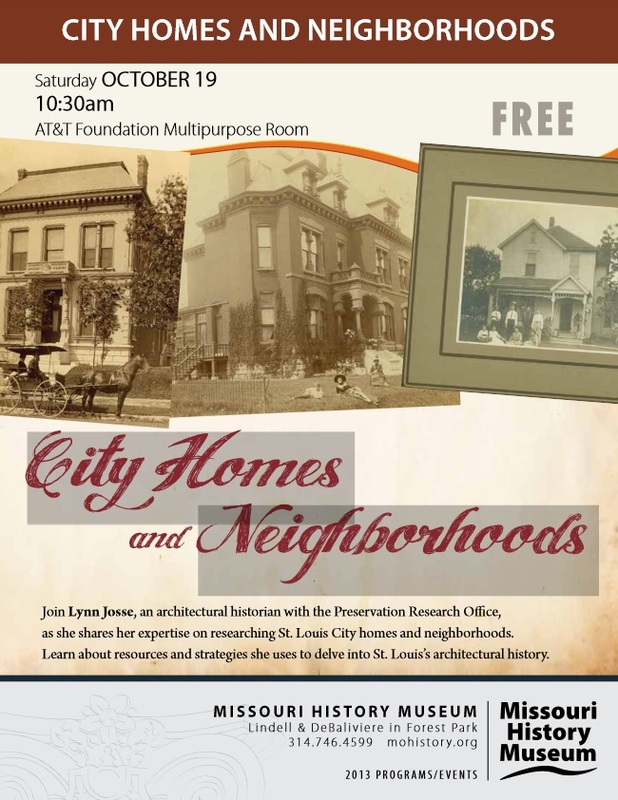 Lecture: National Register of Historic Places: Helping or Hindering Legacy City Preservation? PRO Director Michael R. Allen will discuss what happens when preservation gets in the way of preservation. This talk is part of Landmarks Illinois’ Snapshots series. More information here. 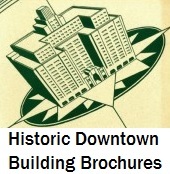 Architectural walking tour offered through Dabble. Part of St. Louis Design Week. Lectures at the St. Louis Art Museum accompanying an exhibit on Serra’ Twain. Tour: Shaw Place and Surrounds. Walking tour to benefit the Shaw Neighborhood Improvement Association led by PRO’s Michael R. Allen. PRO’s Michael R. Allen joined Toby Weiss for a tour of Lindell Boulevard. Public conversation with Michael Allen about the latest issues relating to urban planning, architectural preservation, and public policy in St. Louis. With the city historically accelerating depletion through redevelopment, the focus of the conversation will be on recent happenings in the central corridor (CWE, Midtown, and Downtown) that could be restorative or further the denigration of urban fabric. 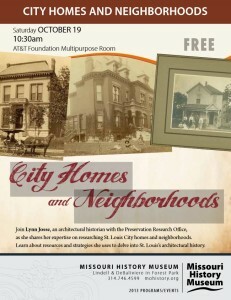 PRO Affiliated Architectural Historian Lynn Josse will tell you how to start researching your home or neighborhood, in a free program. Details here. Join us on this unique community ride of Grand Center and downtown St. Louis, co-sponsored by Trailnet. Geologists Dr. John Encarnacion and Garrecht Metzger team up with PRO Director Michael Allen to explain the complex intersections between the geologic and architectural histories of St. Louis. Details here. Michael R. Allen leads a special walking tour of the St. Louis Place neighborhood in a PRO-sponsored event. $5 a person. Michael R. Allen leads a tour of mid-century modern architecture on South Grand. Details here. Michael R. Allen delivers a lecture in the “Lost Neighborhoods” lecture series sponsored by Landmarks Association of St. Louis. Details here. PRO Director Michael R. Allen joins Alderman Scott Ogilvie and activist Martin Casas for a panel discussion sponsored by the monthly event series City Affair. PRO joins Washington University in St. Louis American Culture Studies program to screen a new documentary on Cairo, Illinois. The Missouri History Museum presented a post-screening Q & A with director Bill Streeter, former Hydraulic Press Brick Company president Bill Allen and PRO Director Michael Allen. Laumeier Scuplture Park sponsors a panel that features artist Juan William Chavez in conversation with Michael R. Allen and Sylvester Brown, Jr. PRO Director Michael R. Allen gave a lecture at the Sam Fox School of Design and Visual Arts at Washington University in St. Louis. Art is Livability Panel: The arts play a critical role in the creating vibrant places, from the individual to the community scale. 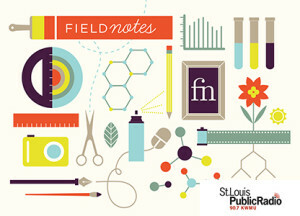 This session looks at three projects along this continuum and their current and possible future contributions to a livable St. Louis through creative placemaking and creative re-use of land and materials. Moderator: Roseann Weiss; Speakers: Michael Allen, Architectural Historian and Director, Preservation Research Office; Gina Martinez, The Pink House; and Jenny Murphy, Executive Director, Perennial. Details here. Registration required. Michael R. Allen spoke to the staff of the Furman Center for Real Estate and Urban Policy at New York University. Michael R. Allen joined Toby Weiss to lead this tour sponsored by Modern STL. As part of the FORM Contemporary Design Show, Michael R. Allen will give a talk that traces the idea of preserving the AAA Building around to the fire that destroyed the AAA’s previous building on that site in 1975. Michael Allen joined host D.J. Wilson to discuss the Pruitt Igoe Now competition, recent developments with the Pevely Dairy Plant demolition, the renovation of the “flying saucer” at Council Plaza and the recent city Treasurer’s race. Podcast here. Michael R. Allen will talk about the Missouri Botanical Garden’s efforts to create a streetcar suburb around the Garden. Details here. What is going on with James Clemens, Jr. House? Attend a lecture by Michael Allen, Director of the Preservation Research Office and hosted by Landmarks Association on the status of the centerpiece of Paul McKee’s NorthSide development. here. This documentary about the past, present, and future of brick in St. Louis chronicles the city’s rich history as both a producer and user of a building material that’s as lovely as it is sturdy. After the film, stay for a discussion with filmmaker Bill Streeter; Michael Allen, director at Preservation Research Office; and author and historian NiNi Harris. The DVD will be available for purchase in the Missouri History Museum Shop. Details here. As part of the night of short presentations of ideas and projects during Rust Belt to Artist Belt, Michael R. Allen will present a talk on the Pruitt Igoe Now ideas competition. Details here. Open to registrants of the conference only. Michael R. Allen leads a 90-minute architectural walking tour of the Central West End. Participants MUST register for the Rust Belt to Artist Belt conference. Details here. Photos and a recap available here. The Travel Channel’s Off Limits program visits St. Louis for a look at hidden and forbidden places. Michael R. Allen is the guide to the Cotton Belt Freight Depot. Annual bus tour of the city led by Michael R. Allen. Michael R. Allen was a tour guide for a mobile workshop at the American Planning Association – Missouri conference. Sponsored by Modern STL. The tour, narrated by ModernSTL board members Toby Weiss and Michael R. Allen, will highlight outstanding examples of mid-century modern architecture in the Metro St. Louis region, driving through and stopping at spiritual, commercial and residential sites. Details here. PRO is partnering with Citizens for Modern Transit to offer a walking tour of one of the city’s most interesting industrial historic districts. The tour is for participants in the Ten Toe Express, and there is a fee. To register or learn more go here. For the American culture Studies program at Washington University in St. Louis. Join architectural historian and co-organizer of the “Pruitt-Igoe Now” design competition Michael Allen as we re-visit the area of the infamous housing project and examine how the local urban scene has (or has not) changed in the years since its downfall. On Thursday, September 7, AIA St. Louis kicked off this year’s Continuing Education series with a session on “Our Mid-Century Modern Legacy.” Michael Allen opened the event with a talk that examined recent threats as well as case studies in success like the owner-driven National Register of Historic Places nominations for Ladue Estates and Stonebrook. Michael was followed by Chicago preservation architect Gunny Harboe, principal of Harboe Architects. Harboe discussed Chicago’s biggest current threat, Bertrand Goldberg’s Prentice Hospital, as well as several rehabilitation projects for Mies Van Der Rohe buildings in Chicago. Mission St. Louis screened The Pruitt-Igoe Myth and followed the screening with a panel discussion on the housing project that included Ron Haynes, Sabrine Rhodes, Paul Fehler and PRO Director Michael R. Allen. Modern STL and the Architecture Section of the St. Louis Artists’ Guild present a lecture by Michael Allen and Lynn Josse. Lynn Josse and Michael R. Allen led a bus tour for the St. Louis Art Museum’s Friends of American Art and Design group. (Preceded by picnic at vacant lot on corner of 14th & Cass, 6:00 p.m.) In its third year, the Chautauqua Art Lab (CQAL) is a week-long grassroots citywide arts festival, free university and art parade. On Monday, May 9th, they are hosting tours of the north side, and architectural history expert Michael Allen will lead a tour of the Pruitt-Igoe site at 7:00pm. The event is free. Details here. Fontbonne University presents this lecture at 2:00 p.m. on Thursday, April 28 at the university’s Library. Michael R. Allen offers a critical examination of efforts to reframe the identity of the St. Louis Place neighborhood on the city’s near north side. Debra Moore, Billie Turner, Andrew Theising and PRO’s Michael Allen joined “St Louis on the Air” host Don Marsh to discuss the new book The Making of an All-America City: East St. Louis at 1450. Michael R. Allen led a bus tour of the city for the Missouri History Museum. Lynn Josse led a walking tour of UMSL’s South Campus, formerly the Marillac College and today the home of the university’s Honors College. Michael R. Allen was a panelist at this event, sponsored by City Affair. Michael Allen led a private tour of the industrial north riverfront for the Business History Conference. Lecture by Michael R. Allen at Cafe DeMenil, 3352 DeMenil Place. Starts at 11:00 a.m.
Michael Allen joined Collateral Damage and host DJ Wilson to discuss the glut of vacant property in the city and what is being done about it. PRO Director Michael R. Allen will be a panelist at this conference. A collaborative ‘zine and installation project by Emily Hemeyer and Michael R. Allen, presented for the Scouthern Graphics Council annual conference. Lynn Josse presented a talk about the Oak Hill, Liggett & Myers and Reber Place historic districts as part of Cafe DeMenil’s lunch lecture series. Michael R. Allen gave the lecture as part of Landmarks Association of St. Louis‘s Mid-Century Modern Masters series. Lynn Josse gave a bicycle tour of the neighborhood.